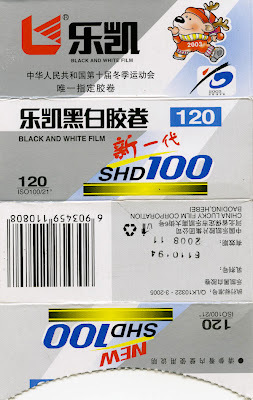 I got several requests about supply and processing the chinese black and white film SHD from Lucky. I buy them when I travel to China and I let them process by a lab with standard bw process for TMax. For me, this is an experimental film, for playing around or artsy projects, not for serious, crips portraits. Same applies to the Shanghai GP film. They scratch very easily !! 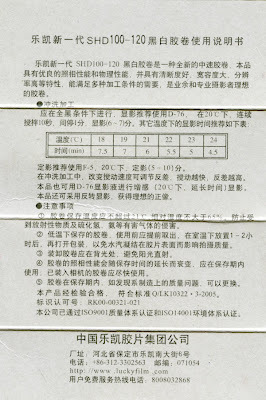 Here the website of lucky (link) and scans of the SHD 100 120 box (copyright by Luckyfilm). Thats all I know about it, sorry folks. On the Photokina 2008 in September they also announce a large format adapter. But both price and availability is not known yet. If it takes the same time to market it like the back itself we sell in the shelf around 2011. I hope earlier ! A rather small revision of the back comes with a internal buffer of double size, which allows to shoot more images in a row. The back also allows remote catpure.